Pyrola minor at the “culvert” site along the Whiteface Veteran’s Memorial Highway in NY. Photo provided by Jackie Donnelly 2012. Pyrola minor, lesser wintergreen, is one of New York’s rarest plant species and is considered critically imperiled. Globally, this circumboreal species is considered stable and is found in many European countries in addition to the U.S. and Canada. Pyrola minor exists at the southern-most point of its northeastern North American range in northern NY (1). State and province conservation status of Pyrola minor. Copyright © 2014 NatureServe, 4600 N. Fairfax Dr., 7th Floor, Arlington Virginia 22203, U.S.A. All Rights Reserved. Botanists have documented two populations in New York State, one near Wilmington Notch, and the other on Whiteface Mountain (2). Stanley J. Smith, a botany curator at the New York State Museum, recorded the Whiteface population in 1961 (3). In 1997, Steve Young of the New York Natural Heritage Program (NYNHP) relocated the population at a slightly higher elevation closer to the summit than the original location documented for the species (2, 3). This population was presumably stable (in the “hundreds”) through the early 2000s according to records in the Biotics database kept by the NYNHP (4). However, the location of the population was in the ditches alongside of the Whiteface Veterans’ Memorial Highway and following maintenance on the road, only 19 individuals were found in 2006 (4). The population rebounded in 2007; however, in July 2014, the number of basal rosettes decreased to approximately 70 and there were only about 9 inflorescences (personal observation). 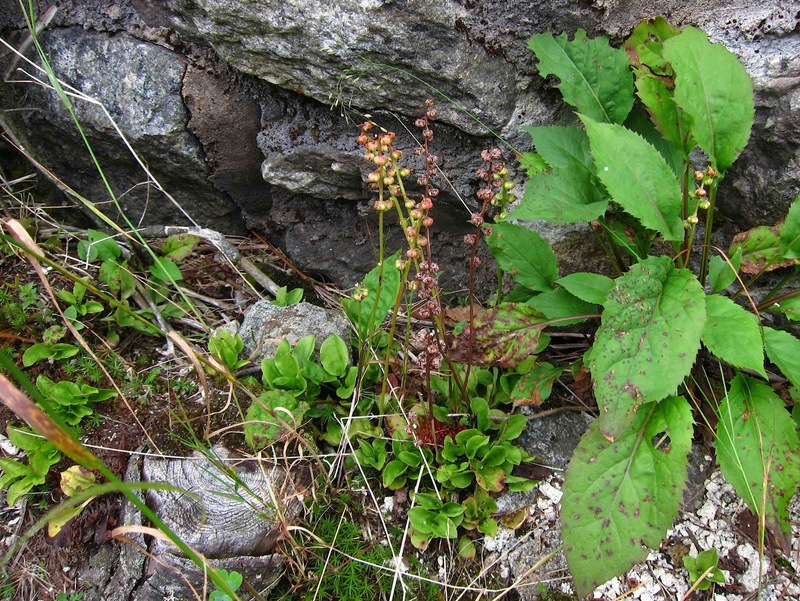 Pyrola minor population on Whiteface Mountain in Essex County, NY based on the observation data in New York Natural History Program Biotics database (1961-2007) and personal observations in 2014. Due to the decreased population, Steve Young asked me to attempt to propagate the species from seed to eventually plant back out on Whiteface Mountain. Through the pouring rain on 8/13, EmilyTyner, Kelly Archbold (a SUNY Plattsburgh student), and I went up Whiteface to collect Pyrola seeds and nearby native soil. Our aim was to collect the mycorrhizae along with the soil that enable the plants to germinate and get nutrients from the soil (5). 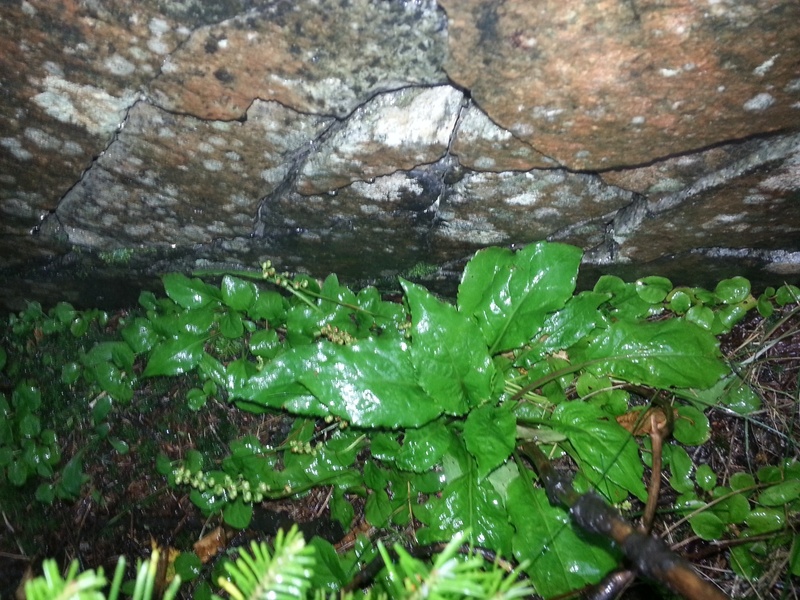 One patch of P. minor is partially hidden back along a rock face and had ~ 7 fruiting stems, and the other patch by the culvert site had 2 fruiting stems. Most of the seed pods were unripe, so we only took a fraction of those which were brown or were starting to turn brown. I estimate that we took ~10% of the seed pods at the 2 sites. We then took about a half 5 gallon bucket’s worth of soil from nearby the Pyrola plants without disturbing them. Finally we filled in the areas where we took soil with native soil. Pyrola minor on the north side of the Whiteface Veteran’s Memorial Highway along a rock face in NY. 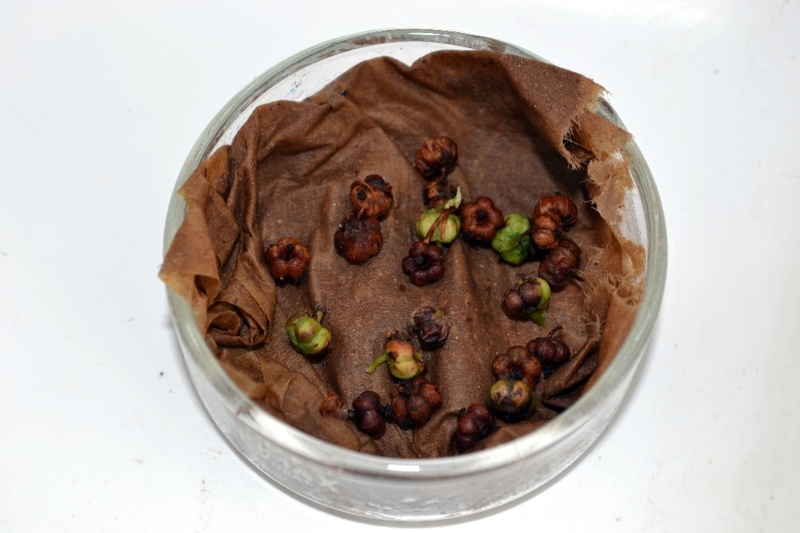 Back in Plattsburgh, we placed the seed pods on a moist paper towel over night, and Kelly worked on extracting the seeds the next morning using a razor blade to open up each of the 5 chambers of the capsule. In all we planted 94 seeds in a flat filled with native soil and watered in the seeds. We will keep the seed flat moist, fairly cool, and shaded in the SUNY Plattsburgh greenhouse (5). Pyrola minor seed capsules collected from Whiteface Mountain. 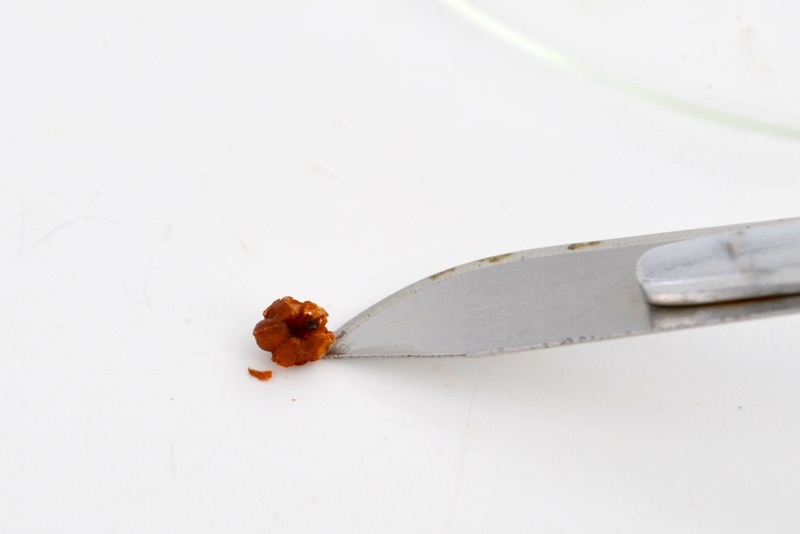 A close up of the Pyrola minor capsule and scalpel used to open each of the 5 chambers to extract the seed. Kelly Archbold holding a portion of the “dust-like” seeds of Pyrola minor she extracted prior to planting. 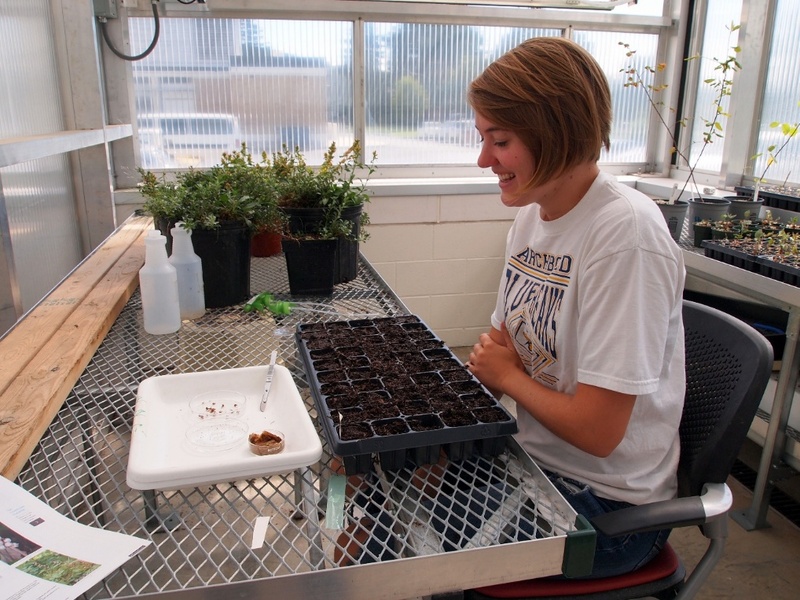 Kelly Archbold in the SUNY Plattsburgh greenhouse with the flat of soil collected from Whiteface and the seeds ready to be planted. 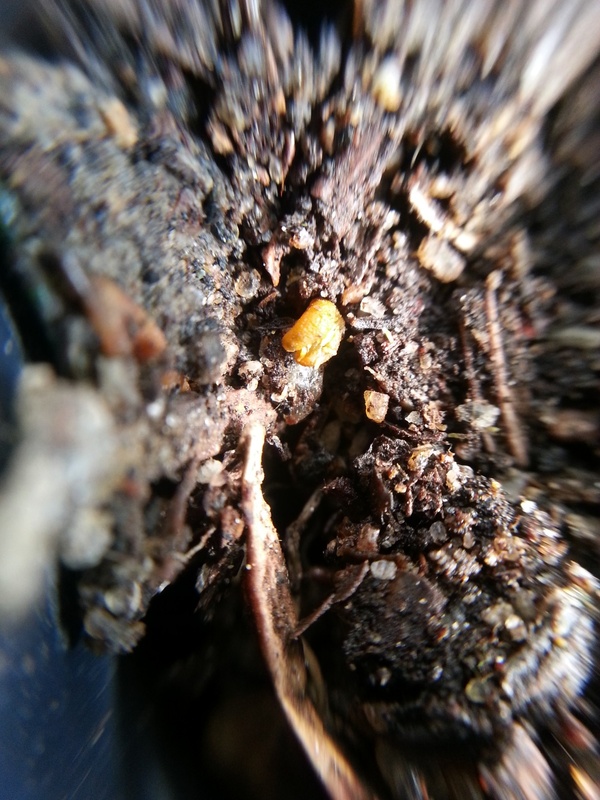 A Pyrola minor seed on soil collected from Whiteface Mountain (4X optical magnification). One source on propagating P. minor stated that regardless of when the seeds were sown, they tend to germinate in the spring (6). However, another source stated that germination can involve growing an underground modified stem that can survive for years before sending up a shoot (7). The most relevant advice was to “be very patient!” (6) Our hope is to plant out any seedlings in the next few years. In the best case scenario, these seedlings will help promote genetic diversity in a rebounding population following road maintenance. 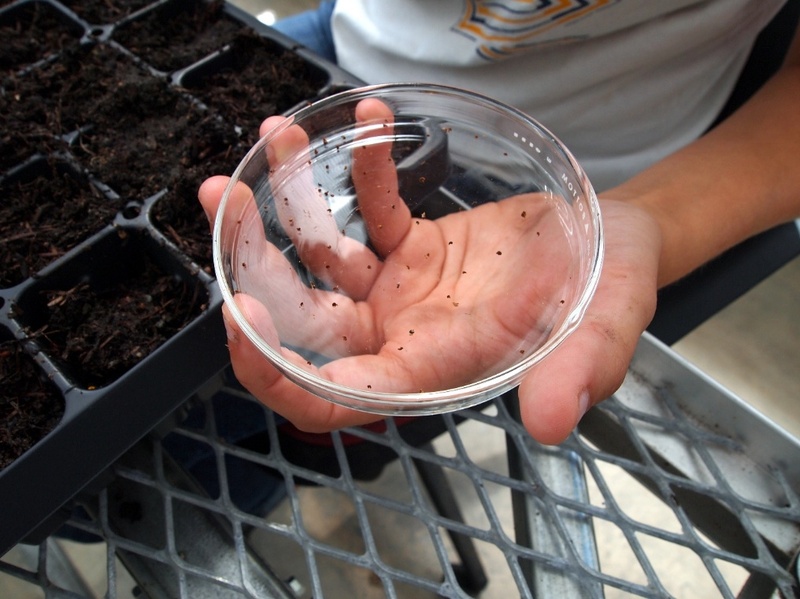 In any case this process will be a learning experience in attempting to propagate this species. (1) NatureServe. 2014. NatureServe Explorer: An online encyclopedia of life [web application]. Version 7.1. NatureServe, Arlington, Virginia. Available http://explorer.natureserve.org. (Accessed: August 21, 2014). (2) Young, S. 1998. Significant botanical discoveries of 1997 – compiled from information received at the New York Natural Heritage Program. NYFA Newsletter 9(1) 4-6. (3) Miller, N. 1998. More on Pyrola minor (Pyrolaceae). NYFA Newsletter 9(3) 2-4. (4) New York Natural Heritage Program. 2010. Biotics database. New York Natural Heritage Program. New York State Department of Environmental Conservation. Albany, NY.